No. 12, Jalan Mutiara Emas 7/10, Taman Mount Austin, 81100 Johor Bahru, Johor, Malaysia. 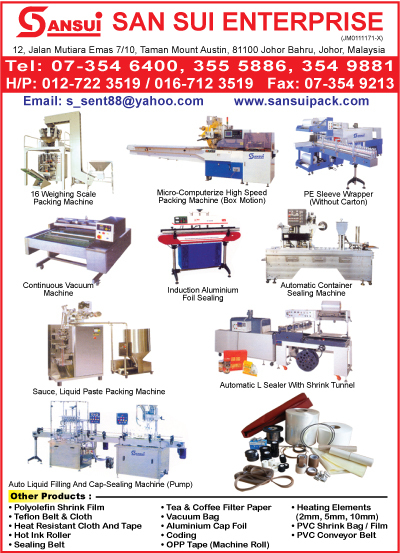 is a company which specialised in packaging machinery and packaging products. The company was established in 1988 with the aim of offering reliable machine and good after sales service to our clients. WE HAVE MORE THAN 20 YEARS OF EXPERIENCE IN PACKAGING MACHINERY.